The 2016 Cooperative Baptist Fellowship General Assembly in Greensboro, N.C., was a special one for our family. We are grateful to the worship planners for inviting us to open the Assembly by reflecting on CBF’s first 25 years, through the lens of Lauren’s life and the ways CBF has shaped her life and that of her parents. 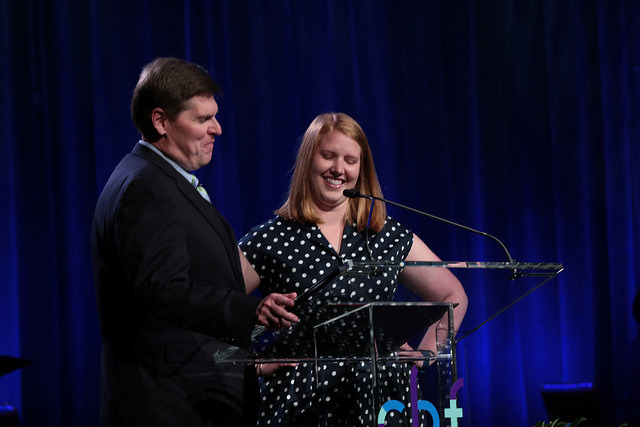 Larry and Lauren Hovis bring greetings June 20 to kickoff the 25th Anniversary CBF General Assembly in Greensboro, N.C.
We came away from Greensboro feeling that 2016 was one of the best General Assemblies yet — and our family has attended most of them through the years. We attribute these positive feelings to the energy we felt, the diversity we observed, and the overall quality of the program we experienced. A highlight for us was the worship service on Friday night. In particular, we were captivated by an image presented by CBF Global Missions Coordinator Steven Porter. He spoke of CBF rallying around “the radical center.” Maintaining unity in the midst of diversity is a challenge for CBF (as for all religious bodies in our time) and will continue to be so in the foreseeable future. We believe coming together around the radical center will help us move forward as a fellowship. Though we both were drawn to Steven’s phrase, we discovered that we held different (but hopefully complementary) understandings of the radical center (based on these definitions) that may reflect our different generational positions. Jesus (not any political or religious authority) is Lord. The Bible (not any human statement about the Bible) is our authority for faith and practice. All believers (not just a select group) are priests, free to relate to God and responsible to serve God in the world. Churches must be free from outside interference in determining their faith and practice (including whom to accept into membership, ordain, and call to any leadership position). Religious liberty is a gift from God (not governments) to all people (not just those who believe and practice as we do) and the best way to exercise that liberty in a democracy is through the separation of the institutions of church and state. Cooperation among Baptists, Christians and all people of goodwill is essential to participate effectively in God’s mission in the world. For Lauren, in addition to these core Baptist principles that are often abandoned by some practicing Baptists, the radical center means something a little different. When approaching this subject as a former political science major, it’s hard for her not to think about the shrinking space our country and the world lends for those who do not identify as “conservative” or “liberal.” In fact, compromise has become a dirty word that describes those who abandon their integrity and even their morality. With this political perspective, she sees many similarities in today’s religious context, specifically the Baptist world in which she has grown up. When describing her religious context to non-Baptist or religious folks, she feels like she never does a good job explaining what a Cooperative Baptist is. Additionally, as someone who identifies as “progressive,” many other self-identifying progressive Baptists ask her how she can be a part of a network of Baptists who may believe and act differently from her. It wasn’t until she heard CBF described as the “radical center” that Lauren could succinctly describe why she is a part of CBF. Today, CBF has the potential to occupy the radical center. This doesn’t mean taking a middle ground, watered-down role on every divisive issue but instead, it means actively allowing space for folks on the left, right and middle to push one another to be the hands and feet of Christ in the world. In a world becoming harmfully polarized, faith groups need a radical center. For Lauren, the term radical has to mean active, challenging, and reformation. Baptists need the Cooperative Baptist Fellowship to occupy this role. But with this role comes much responsibility not only from CBF staff, regional bodies, and ministers but also from lay people. We have to be willing and open to challenge ourselves as Christ-followers to live out this call. No longer can we sit on the sidelines watching both sides hurt one another. It is time radicalize our center. We agree that the world needs a group like CBF to occupy the radical center, for such an approach offers the world’s best hope to move beyond painful, destructive divisions. We agree that Jesus Christ is our root, our radical center. We also agree that Jesus never lets us remain as we are, calling us to be transformed into his image, serving as agents of his transformation in the world. Such a radical faith embraces diverse perspectives that maintain a posture of openness to change from accepted or traditional forms. Larry Hovis is the Executive Coordinator of CBF of North Carolina. Lauren Hovis works in the international development field in Washington, DC. She serves on the Mid-Atlantic CBF Coordinating Council as well as the CBF Missions Council.